I TE PIHOPA, I TE PIRITI, I TE RIKONA. I TE MOHIOTANGA KI A TE KARAITI. NGA MEA O ROTO TENEI PUKAPUKA. 1. Ko te Tikanga mo te korerotanga o nga Waiata. 2. Ko te Tikanga mo te korerotanga o era atu wahi o te Karapiture tapu. The Order how the Rest of Holy Scripture is appointed to be read. 3. Ko te Tepara Tuatahi. 4. Ko te Tepara Tuarua. 5. Ko nga Tikanga mo nga Hakari, mo nga ra Nohopuku. 6. Ko te Tikanga mo nga Inoi o te Ata. 7. Ko te Tikanga mo nga Inoi o te Ahiahi. 8. Ko te Whakapono a Atanatiu. The Creed of Saint Athanasius. 10. He Inoi, he Whakawhetainga, mo nga wa e rite ai. 11. Ko nga Inoi, nga Tuhituhi, me nga Rongo Pai, hei korerotanga, a taka noa te tau. The Collects, Epistles, and Gospels, to be used at the Ministration of the Holy Communion, throughout the Year. 12. Ko te Tikanga mo te Whangai i te Hapa a te Ariki. The Order of the Ministration of the holy Communion. 13. Ko te Tikanga mo te Iriiri i nga Tamariki i roto i te Whare Karakia. 14. Ko te Tikanga mo te Iriiri I nga Tamariki i roto i nga Whare. 15. Ko te Tikanga mo te Iriiri i nga Kaumatua. The Order of Baptism of those of Riper Years. 17. Ko te Tikanga mo te Whakaunga. 18. Ko te Tikanga mo te Karakia Marena. 19. Ko te Tikanga mo te Karakiatanga i te Turoro mo te Tangohanga a te Turoro i te Hapa Tapu. The Order for the Visitation of the Sick, and the Communion of the Sick. 20. Ko te Tikanga mo te Karakia Tanu Tupapaku. 21. Ko te Whakawhetainga a te Wahine mo te Whanautanga o tana Tamaiti. The Thanksgiving of Women after Child-birth. 22. He Riringa, ara, He Whakakitenga atu i te riri, me nga whakaritenga whakawa a te Atua ki te Hunga hara. A Commination, or denouncing of God’s answer and judgements against Sinners. 23. Ko nga Waita a Rawiri. 24. Ko te Tikanga mo te motuhanga i te Pihopa, te Piriti, i te Rikona. He Tepara mo nga whanaunga, mo nga huanga e araia nei e te karapiture, e te ture hoki a te hahi kei marena ku a raua. The Maori are the indigenous people of New Zealand, or Aotearoa. They are of Polynesian stock, and arrived on the islands before 1300. Their language is therefore related to other Polynesian tongues, such as Hawaiian. 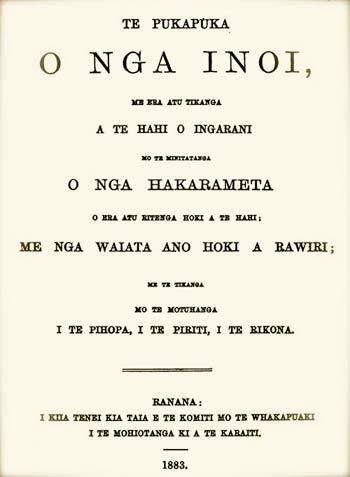 The Book of Common Prayer was first translated into Maori in 1830, and has gone through several translations and a number of different editions since then. This translation of the 1662 BCP is commonly called Te Rawiri ("the David"), as the Maori tend to look for words to be attributed to a person of authority. The Maori translation of the 1662 BCP is still used in New Zealand, particularly among older Maori living in rural areas, in spite of a newer Prayer Book. The text used here (title page at left) was taken from an edition published in New Zealand in 1883, and appears in David Griffiths' Bibliography of the Book of Common Prayer, as 106:11. 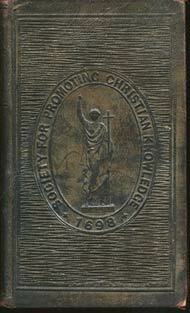 It contains essentially everything found in the 1662 BCP. Note that while modern Maori uses certain diacritical marks (notably the vowel-macron), this was not the case when this book was printed. Google Books has this 1883 printing as PDF graphics, along with earlier printings from 1840 (Griffiths 108:4), 1848 (Griffiths 108:8), and 1859(Griffithe 108:9). Additionally, we have a later 1905 printing (Griffiths 108:12), including a words-only hymnal, available as PDF graphics - see links below. The files include bookmarks and uncorrected extractable text. More information on Maori translations of the BCP may be found in The Book of Common Prayer Among the Nations of the World, and in an essay in The Oxford Guide to the Book of Common Prayer. Thanks are due to Richard Mammana, who transcribed the 1883 text.